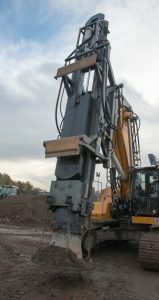 Liebherr and BSP worked together to produce a bespoke rapid impact compactior rig that can also be used as a digging machine. Based at Nottingham in England, Dynamic Ground Solutions, DGS, operates nationwide providing a wide range of engineered ground solutions to the construction industry. From soil stabilisation and modification through to reinforced earth wall construction and performance testing of ground conditions, the company is able to provide almost any solution allowing construction companies to commence operations on previously unsuitable ground. The company has invested in what is believed to be the UK’s only nine-tonne rapid impact compactor which provides deep compaction of soils beyond the effective reach of traditional roller methods. This particular method can be utilised as part of a foundation system as an alternative to traditional piled solutions in most soil conditions. The system employed by DGS is based on a Liebherr crawler carrier and BSP International Foundations (BSP) impact system. The traditional method of mounting a BSP Compactor would be for the excavator manufacturer to supply a boom-less machine with BSP manufacturing and fitting a bespoke boom. Initial conversations between DGS and Liebherr found that the compactor machine may only be used for short periods of time and would be parked up between projects. With this in mind, Liebherr offered an alternative configuration to the one proposed by DGS’s managing director Andy Armstrong. Liebherr engineers in the UK and at the Colmar factory in France put together a package that would see the BSP compactor capable of being swapped for a digging front end. This would potentially increase the machine’s availability and utilisation within the DGS fleet. With an order placed, both Liebherr and BSP engineers worked closely to provide each other with the relevant engineering information required to bring the machine into being. The base 43-tonne Liebherr 946 excavator excluding the front-end and in-cab control systems, is a fairly standard machine, complete with 700mm (27.5 inch) triple gouser pads. It is powered by a Liebherr six-cylinder, stage IV engine rated at 223kW (299hp) at 1800rpm. Despite the hydraulic requirement of the compactor being 250 litres (66 US gallons) per minute, the excavator’s hydraulic pumps are more than capable, producing 305 litres (80 US gallons) per minute. The upperstructure has been modified with a full boxing ring handrail system for additional safety of those working up top. The machine’s CanBus digital wiring system has allowed BSP technicians to easily integrate the compactor’s control system to work in tandem with the machine’s control system. The rig’s cab now boasts five large LCD screens of varying sizes to provide the operator with a myriad of data. Alongside the standard excavator control monitor, the right hand side of the cab is dominated by two further screens, one for the Optronics 360-degree camera system and another for the HH4-RIC data logger for the BSP compactor. This screen gives the operator data from the compactor such as compaction depth per pass and the required blows per pad. It also informs the operator when the designated compaction parameters are achieved. Below the three screens is the large control unit for the BSP system. The company’s Hydrocontrol system allows the operator to manually set the operation of the compactor and records the amount of blows completed by the unit. To the operator’s left is a Topcon GX60 monitor for the machine’s GPS guidance system. This allows for an effective, reliable and fast method of compacting in exactly the right spot. In addition to a Topcon GPS control screen there is a bewildering array of information and control options at the operator’s fingertips. 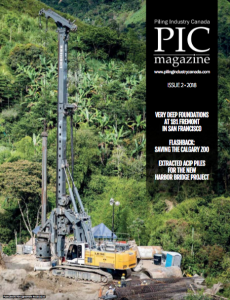 The front-end of the rig consists of a boom foot with a special coupling to allow the fitment of the BSP attachment, or a digging boom and dipper arm. This is a similar arrangement which allows a quick reconfiguration of the machine as found on Liebherr’s demolition rigs. Bespoke cradles have been manufactured to allow for the safe storage of both front ends when not in use. The traditional way to mount the tilt cylinder for such attachments to control the angle of the compactor is from the top of the compactor manufacture’s boom. In this scenario, where the stub boom is fixed to the excavator, Liebherr designed an alternative method in which the tilt cylinder for the compactor is fitted between the hoist cylinders in a more of a face shovel type of configuration. The actual attachment comes from the tried and tested range of BSP rapid impact compactors. The five model range comprises variants with drop hammer weights ranging from five to 16 tonnes, suitable for carrier weights up to 75 tonnes. The RIC-9000 mounted to the Liebherr, as the name suggests, has a nine-tonne hammer weight and is capable of 35 to 45 blows per minute, with an impact energy of 106kNm. In layman’s terms, the heavy weight is dropped to a 1.5m-diameter foot from a height of 1.2m, and the force produced compacts the ground below. Incidentally, the original design was developed in conjunction with the British Ministry of Defence, as a means of quickly repairing damaged aircraft runways. Despite the simplicity with which the compactor operates, the results obtained are ideally suited to poorly compacted or loose and shallow deposits of ground. 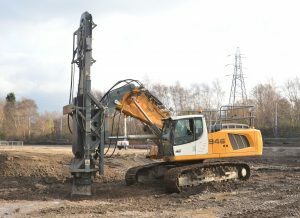 A site for a new Ikea superstore near Sheffield in northern England was DGS’s first use of the rig on a project. The company’s primary task was to consolidate the ground at specific locations in readiness for the construction work, which involved 300 steel columns sitting on pads. The initial work saw a team from DGS excavating the site of every pad, which was reinstated in layers as the compaction work progressed. Each pad consists of five separate compaction points, with up to 60 blows required on each point on each layer. Most pads require three separate visits, as the layers are brought up from the excavated level to the finished level. There is also another excavator and a dozer from the DGS fleet on site. The compactor rig usually works in a large grid pattern, while the other machines work just in front of the compactor to bring the excavated pads up to the next required level. Thanks to the combination of the data logging and Topcon GPS systems, the team can send daily progress reports back to the construction team. Meanwhile, the BSP control system ensures that the compaction foot stays in constant contact with the ground at all times during the compaction cycle. This constant contact with the ground ensures there is no chance of any material being thrown out of the compaction zone, making a very safe operation. The RIC-9000 mounted to the Liebherr has a nine-tonne hammer weight and is capable of 35 to 45 blows per minute, with an impact energy of 106kNm. During the three months the DGS team had been on site the new rig had been performing exceptionally well. There were a few teething issues which came as no surprise to the team, but they were soon rectified by Liebherr and then BSP engineers. With the initial problems ironed out it is satisfying to see that both Liebherr and BSP were willing to collaborate with each other to bring what is deemed to be a UK first to the market.